On our recent trip to visit Ned’s parents in Cornwall, we found ourselves driving past Jamaica Inn. Ned & I haven’t been there since we met 20 years ago, so we popped in to show our two girls the famous, spooky hostelry. They, unfortunately, have only heard it mentioned during our discussions about the recent-ish TV adaptation and the ensuing ‘mumblegate’. For those of you who missed this piece of fascinating recent history, the BBC adaptation, starring Jessica Findlay Brown (she of Downton, series 1, died after she married the chauffer), was roundly criticised for being largely incomprehensible due to the actors mumbling their lines through thick, west country accents. Since its recent takeover, the Inn has clearly undergone a deep cleanse and a new gift / farm shop has been added, much to the delight of our two pre-teens. I knew the curios room had gone years before but was still sad to see the reality of its demise. It really was the strangest room to explore and definitely added to the otherworldly nature of the place. It was macabre and disturbing with jars full of preserved body parts, stuffed animals and the like. Seriously odd. She wrote: ‘When I found your website, we were on our holiday in England, racing by train across the countryside. 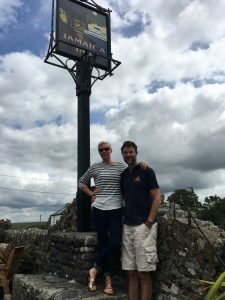 One of our stops on our rambling excursion was the Jamaica Inn… Although he’s (her husband) unfamiliar with anything Daphne du Maurier wrote, he knows how much she and her work means to me, and that part of the trip was especially dear. (I must have 100 pictures of her writing desk from the little museum there…) ‘. I loved having these e-chats with this Canadian couple, and have had so many more since, with all sorts of fascinating and fabulous people. I do not exaggerate in the slightest when I tell you how wonderful it is to be able to connect with so many amazing people from all corners of the world. One lady in question is Dr Laura Varnham who is a Lecturer in English at University College, Oxford. She is a regular contributor to the du Maurier events at the Fowey Festival (and to our somewhat less cerebral facebook and twitter posts!) and is currently writing a book on Daphne du Maurier, which we are looking forward to enormously. I have come across her name a lot, but finally got to introduce myself when she wrote a review on the recent ‘My Cousin Rachel’ film – the one with Rachel Weisz and Sam Claflin. Do see it, it’s very good! Another amazing lady is French author Tatiana de Rosnay. 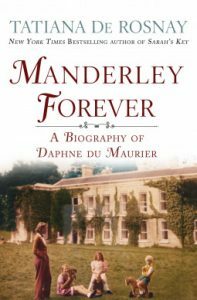 Already a bestselling author of books, such as Sarah’s Key, she has just released ‘Manderley Forever’, a biography of Daphne, which Kits (Ned’s dad and Daphne’s son) has praised as possibly the most accurate account to date. She very kindly sent Ned a copy with a lovely message written inside the front cover. We were both very touched and read it straight away (rude not to in those circumstances!). Again, thoroughly recommend if you fancy a read. Ned’s currently rather taken with a different du Maurier biographer who recently commented on a previous blog that he’s ‘quite handsome’ so he’s perfectly happy with that! A quick final mention goes to Anna Mazzotta, who we got to meet through a watch / work thing. 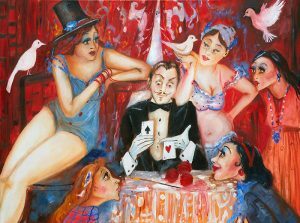 She’s a stunning, petite woman who creates enormous, vibrant pieces which are also very funny indeed…brings to mind a modern day Beryl Cook for me but she may not agree and I have no intention of causing insult, so I’ll just say it’s brilliant and well worth a look. I realise this blog could turn into a name check of lovely people, but I think you probably get the idea, so I’ll stop there. I hope, in time, my girls may take their children to Jamaica Inn and tell them about the time they visited with us all those years ago. And how mummy wouldn’t let them buy anything from the gift shop and they weren’t even allowed a glass of coke but had to have boring water with lunch…happy days!